Tag line: "The man who made 007 a household number"
The last “official” Bond movie to star Sean Connery (he would return to the role of 007 in 1983’s Never Say Never Again, a remake of Thunderball released not by Eon Productions, but Warner Bros., setting it apart from the rest of the series), 1971’s Diamonds are Forever has a few interesting moments, yet is undermined by a complex plot, a lack of action, and a tone that borders on the silly. After hunting down his arch-nemesis, Ernst Blofeld (Charles Gray), Britain’s top secret agent, James Bond (Connery), is assigned to investigate a diamond smuggling operation. Assuming the identity of Peter Franks, a known smuggler, Bond heads to Amsterdam where he meets up with Tiffany Case (Jill St. John), who has a large shipment of diamonds headed for California. Aided by his C.I.A. pal, Felix Leiter (Norman Burton), Bond successfully smuggles the diamond into America and immediately hides them. Following a run-in with a couple of hired assassins named Mr. Wint (Bruce Glover) and Mr. Kidd (Putter Smith), 007 makes his way to Las Vegas, where he hooks up with Tiffany Case, who helps him figure out the identity of the “interested party” attempting to buy the diamonds. To his surprise, Bond finds himself facing off against an old nemesis, with the fate of the world once again resting on his shoulders. Despite the fact he looks noticeably older (even older than he did in You Only Live Twice), Connery is still excellent as Bond, handling the character’s now-familiar personality traits (suavely sophisticated one minute, ready for a fight the next) to perfection. Jill St. John does an adequate job as 007’s lady-of-the-moment, though her character’s flighty nature earns her a place as one of the series’ more forgettable Bond Girls (I found Tiffany’s ineffectiveness in the movie’s final scenes particularly frustrating). As for the villains, Charles Gray is fine as Blofeld, and unlike a good many people I didn’t have a problem with Wint and Kidd, Blofeld’s henchmen who are more than simply partners in crime (the various methods they use to eliminate a target, such as dropping a scorpion down the back of an intended victim, keeps things interesting). Country music singer (and sausage king) Jimmy Dean goes way over-the-top in his brief appearance as billionaire Willard Whyte, but I have to admit I got a kick out of his character, too. What ultimately hurt Diamonds are Forever isn’t its characters, but the film’s overall story, which (at the outset, anyway) I had a hard time following. A lot of people are part of this diamond ring, and, admittedly, I couldn’t keep track of them all (seeing as a good number appear on-screen for about a minute, then turn up dead in the very next scene, I have no idea why the filmmakers included so many in the first place). 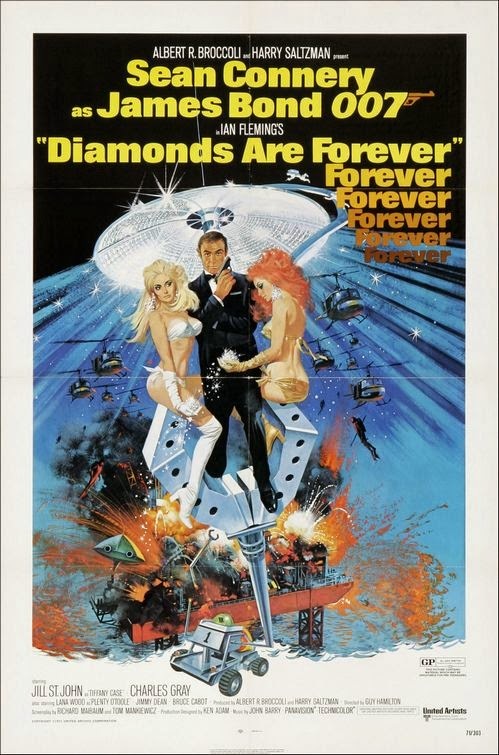 Unlike the other movies in the series, Diamonds are Forever is also short on action, feeling more like a suspense/thriller about jewel thieves than a Bond picture. That’s not to say it’s devoid of thrills; the pre-title sequence, where 007 is hunting down Blofeld, gets the film off to a promising start, and the car chase through the streets of Las Vegas is a high point. I also enjoyed Bond’s battle against a couple of babes known only as Bambi (Lola Larson) and Thumper (Trina Parks), whose acrobatic moves made them tough to beat. But aside from these scenes and a handful of others (including the now-standard final attack on the villain’s lair), Diamonds are Forever is sorely lacking in the action department. What’s more, Diamonds are Forever is, at times, damn goofy. Trying to track down the stolen diamonds, Bond masquerades as a scientist in one of Willard Whyte’s laboratories (where he’s convinced the jewels are being held). Once his cover is blown, he attempts to escape by way of a mock lunar module, which he finds on a sound stage where a phony moon landing is being filmed. The sight of 007 busting through a wall in this strange vehicle is bad enough, but he looks even more ridiculous when, later in the scene, he hops aboard a 3-wheel dune buggy and speeds off into the desert. Sequences like this would become commonplace in Roger Moore’s Bond adventures, which favored a lighter, humorous tone, but to see Connery driving around in these clumsy vehicles was, to put it bluntly, a total embarrassment. After a string of excellent films (Dr. No, From Russia With Love, Goldfinger, and Thunderball), Sean Connery ended his run as James Bond in less-than-stellar fashion with You Only Live Twice and this movie. The time had come for another actor to tackle the role (aside from George Lazenby, who, after On Her Majesty’s Secret Service, gracefully walked away from the part), and that actor was Roger Moore. … To be continued next month, when James Bond returns in Live and Let Die. Sean Connery was my favorite Bond until Casino Royale came out then well. that all changed.